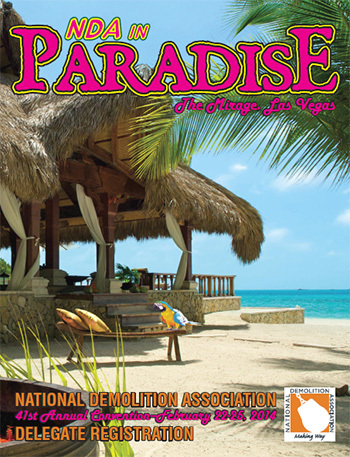 The NDA's 41st Annual Convention is the largest exposition of demolition equipment, products and services in the world. This year's show is less than six weeks away. Multinational suppliers like Caterpillar, Liebherr, Volvo Construction Equipment, Stanley LaBounty, Genesis Attachments, Allied Gator, Link-Belt, Husqvarna, Brokk and a 100 other associate members firms will be in The Mirage Exhibition Center Feb. 23-25 to show the latest innovations to make your business more profitable. The new Affordable Care Act and its implications to small and entrepreneurial businesses will be analyzed by Jennifer Berman, a labor and employment attorney, during an educational session at the NDA Convention, Feb. 22-25 in Las Vegas. Recognized as the "final word" in safe work practices on demolition jobsites, the manual has been updated with new information about a variety of topics, including the latest on hazardous material handling and quick coupler safety. It is also more easily searchable on mobile devices. You’ve been given early access to deep discounts on office supplies and equipment from a new AchieveLinks program. Through AchieveLinks, members will save up to 60% off all office supplies and equipment at Office Depot. Buy for your association and spread the word to members to save on office supplies as well! The Ohio Department of Transportation began demolition this week on the closed 1959 Inner Belt Bridge. The bridge’s concrete barriers, lights and railings are being removed first, followed by the removal of the deck using traditional methods. Once that is complete, several spans of the bridge, east of the Cuyahoga River, will be removed by a controlled demolition using explosives. Numerous factors make autumn and winter a dangerous time of year for contractors. Shorter days means less daylight to avoid hazards such as slippery fallen leaves, ice, and rainwater. Indeed, worker compensation claims shot up 14 percent during a bout of severe weather in January 2004, according to an OSHA article. A lecturer from the University of Wolverhampton is using computer games technology in a bid to improve computer design in the construction industry. The size of the average American homes has surpassed 2,000 square feet, according to information pulled together by Lindsay Wilson at the website Shrink That Footprint. How does this compare with the rest of the world? Well, as you might expect in the land of the McMansion, U.S. homes are big by global standards, even compared to wealthy nations. But the U.S. isn't the king of big houses, at least not using the 2009 data: Australia won that distinction, at 2,303 square feet. After drilling four deep shafts and sending a man down to look, Seattle Tunnel Partners and the state Department of Transportation don't fully know yet what's blocking tunnel machine Bertha, some 60 feet deep next to Pioneer Square. So the DOT announced it is "going hyperbaric," by sending workers to the pressurized cutting face. Teams of five or six workers would take turns inspecting the huge area.